On Wednesday evening, I wrote to all civil servants about the appointment of our new Prime Minister, Theresa May. Over the last two days, the PM has been appointing ministers to roles across Whitehall, and I can now give more details about the new government. Among the senior offices of state, we have a new Chancellor, Philip Hammond, and a new Home Secretary, Amber Rudd. And while Michael Fallon, Jeremy Hunt, Alun Cairns and David Mundell have all remained in their current posts, Chris Grayling, Liz Truss, Justine Greening, Greg Clark, Patrick McLoughlin and Sajid Javid have been appointed to new roles. 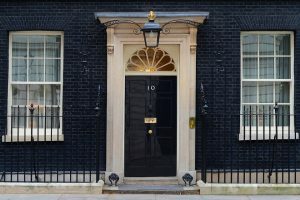 There have also been a number of new appointments to the Cabinet, including Boris Johnson as Foreign Secretary, Andrea Leadsom as Secretary of State (SoS) for Defra (Department for Environment, Food & Rural Affairs), Priti Patel as SoS for DFID (Department for International Development), Karen Bradley as SoS for DCMS (Department for Culture, Media & Sport), Damian Green as SoS for DWP (Department for Work and Pensions) and James Brokenshire as SoS for Northern Ireland. I’m sure many of you will be keen to know of any other changes to the ministerial teams within your department. These will continue to be announced over the next few days and can be followed on GOV.UK or via your department’s intranet. As well as the ministerial appointments, there have been a number of changes to the structure of government. 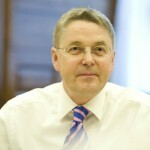 Two entirely new departments have been created: the Department for Exiting the European Union, headed up by David Davis, which has been set up specifically to take forward the result of the referendum; and the Department for International Trade, led by Liam Fox, which will be responsible for promoting British trade across the world and negotiating new trade deals with non-EU countries. There have also been significant changes to two existing departments. DfE will take on responsibility for higher education and further education policy, apprenticeships and wider skills policy from BIS, allowing an end-to-end view of skills and education. And the Department for Business, Energy and Industrial Strategy has been created, bringing together existing functions of the departments for Energy & Climate Change and for Business, Innovation & Skills, including responsibilities for business, industrial strategy, science, innovation and energy. So, the new Government will mean changes for many of us. As civil servants, that is nothing new. Change is one of the constants in our working lives. Reacting to change is what we do; what we have done so effectively in the past, and especially over the last few years. And we do this while making sure the wheels of public service keep turning smoothly. We are in one of those moments that demonstrate most clearly the vital role of the Civil Service - ensuring the continuity of government while preparing the ground so that the new administration, with new priorities, can hit it running. And so it is more important than ever that we pull together to harness our unrivalled experience and expertise. Our vision of ‘A Brilliant Civil Service’ and the related Civil Service Workforce Plan - published this week - will help us to do just that. If you haven’t had a chance to read about them yet, I strongly encourage you to have a look. Central to both is a commitment to developing our people; giving all civil servants the support they need to be the best they can be. I met Ben Gummer, the new Minister for the Cabinet Office, this morning and agreed that we will look to work closely together to implement both the vision and the plan. Finally, I’d like to reaffirm the Civil Service Board’s commitment to our top three priorities of diversity, digital and commercial. It was great to hear from the Prime Minister in her first statement that opportunity for all will be one of the over-arching themes of her premiership. This finds a strong echo in our own plans for a Civil Service that is truly representative of the society it serves, giving career opportunities to the best talent in the country, regardless of background. Through our focus on these areas, and through your continuing professionalism, flexibility and skill, I have no doubt that we will once again successfully tackle the challenges ahead. Can diversity please include the likes of geographical diversity please. In a digital age, the physical embedding of the senior civil service (SCS) in parts of the country other than London would be a good thing: there shouldn't be a career glass ceiling for those not living/working within an easy commute of Westminster (which is in any case due to close for major refurbishment at some point in any case, so maybe now is a good time to finally break up the SCS club a little?). Should this not read "what the new cabinet looks like" as it's still the same incumbent government and elected party, just new cabinet members and a PM . 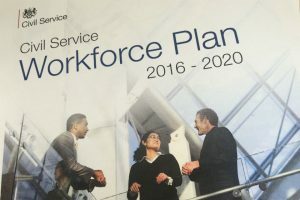 Although the Workforce Plan mentioned both attracting and retaining personnel, the actions themselves only relate to attracting personnel - what is being done to retain and develop people despite funding cuts? In addition, how can we recruit externally by default when we are not looking to increase our overall CS 'footprint', and indeed a civilian drawdown of 30% being implemented as mentioned in the 2015 SDSR? What happened to only using abbreviations after the "full" version has been used with the abbrevaition in brackets afterwards? And what about consistency? e.g. "...Secretary of State (SoS) for Defra, Priti Patel as SoS for DFID..." What is DFID and what is the thought behind if we need Sectreary of State = "SofS" we don't need the full version of "DFID" to know what that means. To those of us not well versed in the massive scope of all the Departments a consistent approach would have been exceptionally useful. We are well rebuked. Department names now appear in full as well as in abbreviation. I heartily agree with Hugh Neill on the point above about geographical diversity. I work for defra but live and work at home in Leeds. In the main, with modern technology, (well as modern as defra can afford) it works, but frustratingly the mindset is still very London-centric in terms of meetings at short notice and your career options/aspirations being also London centric. In the 21st century, I think the excuses that places are 'too far away' is fast becoming less watertight than it ever was...the rest of the country makes the effort to come to London...why can't the reverse work equally as well with more clusters of staff (not even necessarily office space) in the regions? the technology available today would make this work equally as well. Hear Hear. I think this impacts women more than men as well, due to the fact that despite advances in attitudes, it is still women more often than men that shoulder the burden of caring for young children and the expectation that they will not be away from home overnight on a frequent basis...even more so for single parents like myself with very few options for childcare outside of school/afterschool club hours; I am finding the need for regular long distance travel in many advertised posts to be a real career blocker.